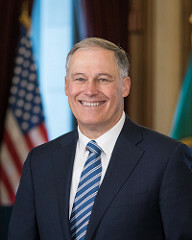 WASHINGTON D.C. – Washington Governor Jay Inslee has been elected to be the new chair of the Democratic Governors Association. He has served as vice chair as of December 2016, and now takes over the main role of leadership, filling the shoes of Governor Dan Malloy of Connecticut who has served since December 2015. The new elected vice chair is Governor Gina Raimondo of Rhode Island. Inslee has already begun to lay out the organization’s priorities as they head into the 2018 election cycle.